ROCHESTER, Minn. - Northbound Interstate 35 bertween Albert Lea and Owatonna has reopned but the southbound lanes remain closed late Monday afternoon. The Minnesota Department of Transportation says southbound I-35 south of Interstate 90 at Albert Lea is open to Iowa, but that section will be closed temporarilty early Monday evening in order to removed a vehicle from the highway. The Freeborn County Sheriff's Office says westbound Interstate 90 is now open from Austin to the South Dakota border. 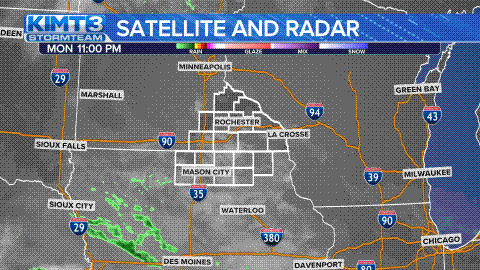 ROCHESTER, Minn. – Interstate 35 remains closed from Owatonna to the Iowa border and Interstate 90 is closed from Highway 52 near Rochester to Albert Lea. The Minnesota Department of Transportation says a no travel advisory remains in effect for most highways in southeastern Minnesota and drivers are encouraged to stay off the roads while snowplows continue to work. Expect I-35 and I-90 to remain closed in southern Minnesota until Monday morning, MnDOT told KIMT on Sunday night. DOT officials told KIMT they estimate the roadways will reopen late morning. MnDOT (District 6) said plows have been out since Saturday afternoon and have been working around the clock. Around 100 plows have been out, some of which have gotten stuck. They said their biggest hurdle Sunday was assisting stranded motorists. They added much of the work they’ve done was undone due to the blizzard. MnDOT said getting everything back to normal will be a slow process due to ice being underneath the snow, and they said it could take a couple of days until the job is complete. All north and south bound roadways in Olmsted County are blocked with snow in one or multiple locations. All east and west bound roadways are nearly impassable and still extremely dangerous. Snowplows and all first responders including the Olmsted County Sheriff's Office are being pulled off of the roads and will only respond to serious emergencies. Feb 24, 2019 – ROCHESTER, MINN – The City of Rochester is making every effort to respond to snow accumulation, while keeping safety a top priority. The community is asked to assist with this effort by removing vehicles from streets. This allows plows to clear the roads and helps ensure public safety vehicles can navigate roads effectively. Details pertaining to specific City of Rochester departments can be found below. Public Works crews have been operating since midnight and will stay on the roads until 4pm today. The intent is to have been on all routes at least once. As of 4pm, crews will have been working for 16 hours are required to have a rest period. The crews will re-mobilize at midnight and plow all routes. Community members are asked to move vehicles from City streets, as to allow for the most effective plowing on all routes. This help ensure public safety vehicles can respond to emergencies in a timely manner. The Rochester Public Library is closed today, February 24, 2019 due to the weather. All public transit service has been suspended for the remainder of today, February 24, 2019. Efforts will be made to resume service for tomorrow, February 25, 2019. Updates about service can be found on the RPT website. The airfield is currently closed. Airport staff will continue to monitor the airfield and reopen when it is safe to do so. #MnDOT crews in Southeast Minnesota have been out for more than 24 hours, with no end in sight. remain off the highways to avoid getting stuck according to the Minnesota Department of Transportation. roads, but high winds diminish the work they’re able to do. ambulance transports to Rochester since the early-morning hours. Post by Freeborn County Sheriff's Office.